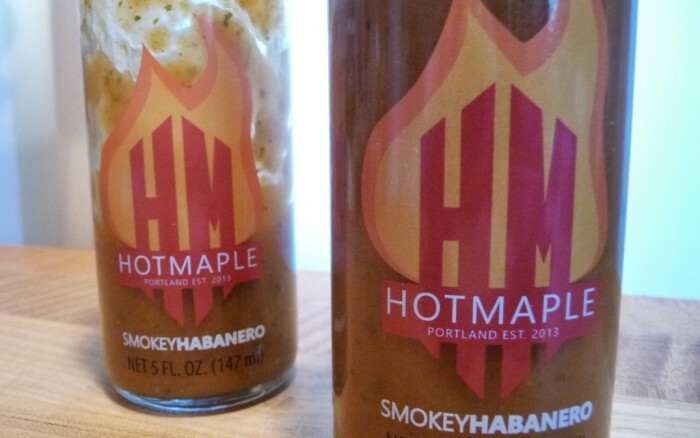 Hot Maple Smokey Habanero sauce from Portland, Oregon uses Grade-A Dark Amber maple syrup, a special blend of spices, and locally sourced Habanero peppers to create its unique sweet-smokey flavor. Hot Maple Smokey Habanero creator Matthew Hilla has crafted a delicious, smokey-sweet hot sauce using maple syrup and habaneros. 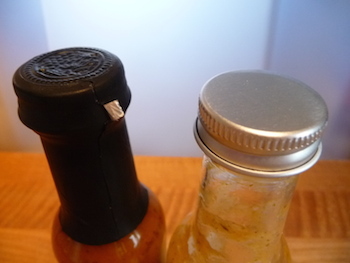 Long time readers of HotSauceDaily know that I’ve never been a big fan of habanero sauces. Once upon a time, the habanero chile or sauce was my least favorite. Then something like Hot Maple comes along, and turns me completely around. Ingredients: yellow onion, diced tomatoes (tomatoes, tomato juice, salt, naturally derived citric acid and calcium chloride), water, apple cider vinegar, habanero (habanero peppers, salt, citric acid), garlic, pure maple syrup (US Grade A Dark Amber). Contains less than 2% spices and liquid smoke. Texture & Appearance: This is a fairly thick sauce that is mildly pulpy. It won’t run off your food – it keeps its consistency. It smells smokey, peppery, and sweet. Full-bodied. Taste Straight Up: Definitely a habanero sauce – the habby flavor is classic and spot on. The smokiness is no doubt due to the liquid smoke, but it’s not overpowering at all. And the maple syrup adds a unique sweetness to the mix. Good balance of heat, sweetness, and smoke. Good for everyday use. Heat Level: – Mild. One of the mildest habanero sauces I’ve tried. It can light you up for a few seconds, then disappear behind the sweet maple syrup and smokiness. Pleasant. Label/Graphics: The clear label wrap on the bottle really shows off the sauce. The logo and graphics are simple and classy – love the design. But I’m not a fan of that clear style label. Usually, and quite so in this case, the graphics just don’t stand out or pop enough for me. 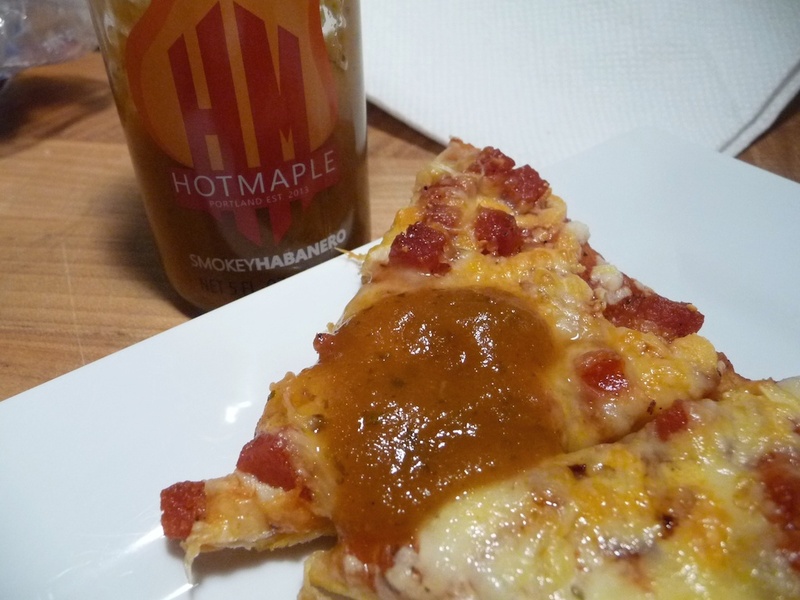 Hot Maple’s color scheme almost matches the sauce, only adding to the lack of contrast. Those graphics really need some brighter colors on a clear label. Bonus points for the awesome metal cap on the bottle! 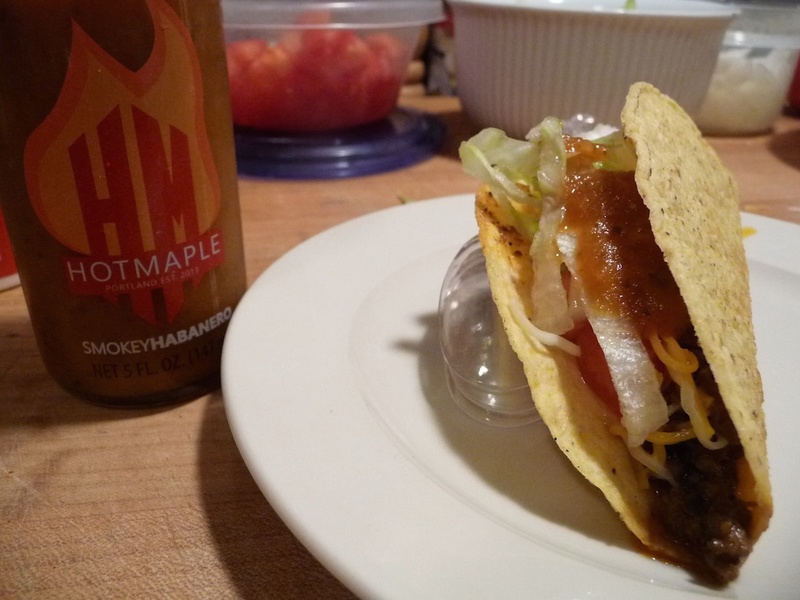 I loved Hot Maple Smokey Habanero on my tacos. It gave me everything I like about a taco sauce – sweetness, heat, and a thick texture. On pizza, again another winning combo. As you can see from some of the pics, I really went through most of the bottle working on this review. Overall Rating: – 4.5/5 stars – A perfect example of flavor over heat in a habanero sauce. Highly recommended! 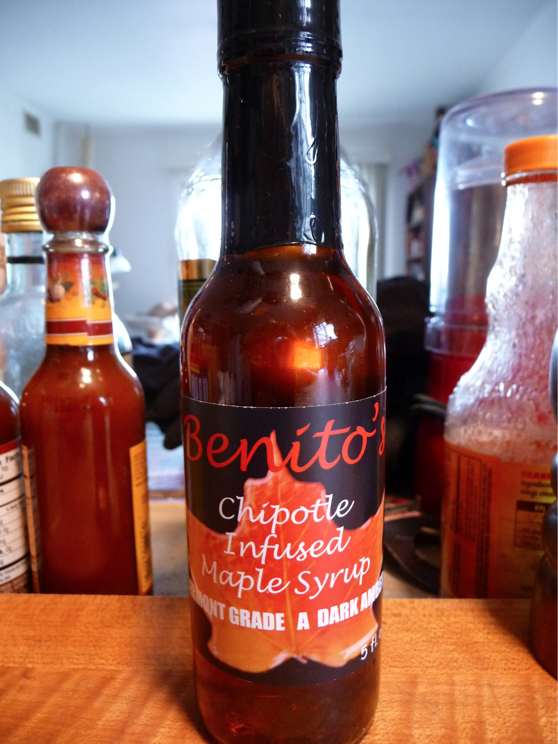 We received a nice surprise in the mail recently; a bottle of Benito’s Chipotle Infused Vermont Maple Syrup. 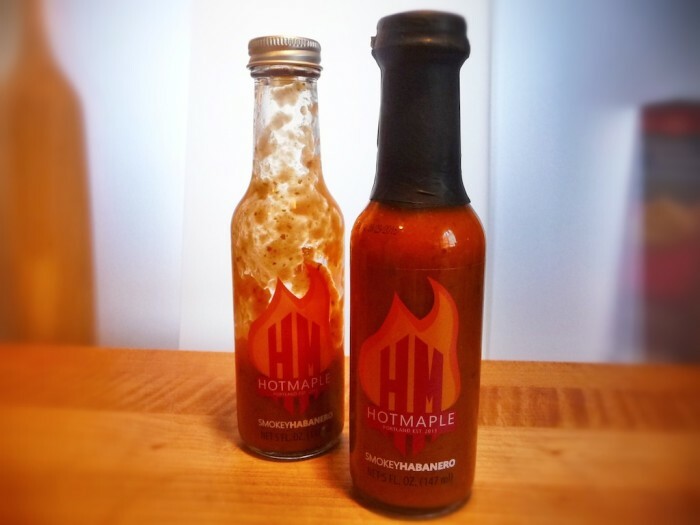 When we first unwrapped the bottle, we thought, “Hmm, we’re not really crazy about heat with our sweet, but we love maple syrup”, so we decided to give it a try. The first taste was a warm, smokey sweetness, with a nice heat that lingered for just a moment. This morning, we cooked up sausage patties (we used a mild version so we wouldn’t affect the heat level of the syrup) and pancakes. With just a light drizzle on the pancakes, we were brought back to sitting by the campfire eating pancakes and sausage cooked over the flames. Smokey, sweet, with a nice mellow heat filling my mouth, I wound up dunking the pancakes into a bowl of the syrup. It was so good, I had to sit right down and write this review. WINNER! Perfect blend of sweet, smoke and heat. 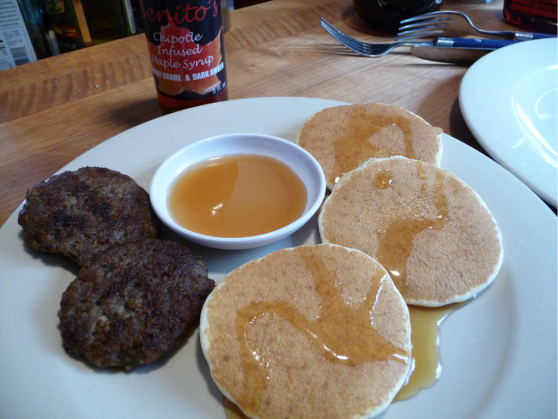 VT Maple Syrup, organic chipotle peppers.